Universal Pictures has not officially confirmed the title of Fast & Furious 8. For the past few weeks, those involved with the production have been calling it Fast 8. 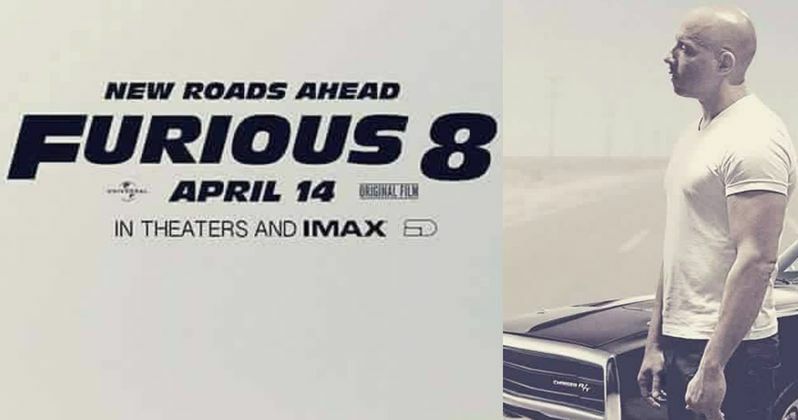 Today, star Vin Diesel shared what appears to be a new poster for the sequel on his Facebook page, and it is clearly titled Furious 8. But this isn't the first poster the actor has shared with fans. And it looks like another piece of fan art to us. This was not released on the official Universal Pictures or Fast & Furious 8 social media accounts. You can take a look below and judge for yourself. Is this a real poster or another weird mock-up? We're going with the later. Vin Diesel doesn't provide any new kind of production information with his latest post. Last week, it was announced that Scott Eastwood was taking on a key role in the sequel. Though his character wasn't revealed at the time, it is believed he is taking over the lead once occupied by Paul Walker. That is not to say he will be playing Brian O'Connor, but his new character might be related to the former police detective gone rogue. Charlize Theron recently signed on to play the main villain and Game of Thrones star Kristofer Hivju is starring as her primary henchmen. Franchise mainstays Vin Diesel, Dwayne Johnson, Tyrese Gibson and Michelle Rodriguez are set to return, along with Jason Statham's Deckard Shaw. Deckard first surfaced in the end credits scene of Fast & Furious 6 and became the main villain in Furious 7. No story details have been uncovered yet, but the action is set to primarily take place in New York City. The sequel will be shot in New York and Atlanta, with production also set to happen in Cuba, Iceland and Russia. Principal photography is scheduled to begin sometime next month, so we should be hearing about more casting additions in the near future. There have been rumors that the production is bringing back 2 Fast 2 Furious star Eva Mendes as Customs Agent Monica Fuentes, but that hasn't been confirmed. F. Gary Gray, who directed last year's box office sensation Straight Outta Compton, is taking the helm on Fast & Furious 8, working from a script by Chris Morgan. The writer is responsible for penning every movie in the series, except for the first two, 2001's The Fast and the Furious and 2003's 2 Fast 2 Furious. Universal has already set an April 14, 2017 release date for Fast & Furious 8. You can take a look at the latest poster and decided for yourself: Is this real? Or is it just Vin Diesel having some fun with fans. As the tagline states, there are certainly 'new roads ahead'.